Attacks, Reprisals And Church Burnings As Egypt Teeters : The Two-Way Fears are growing that the country may be headed toward civil war. The interim government and the military leaders who ousted President Mohammed Morsi have been cracking down on his supporters. Hundreds have died and thousands have been wounded. Twenty-five off-duty police officers were killed Monday. 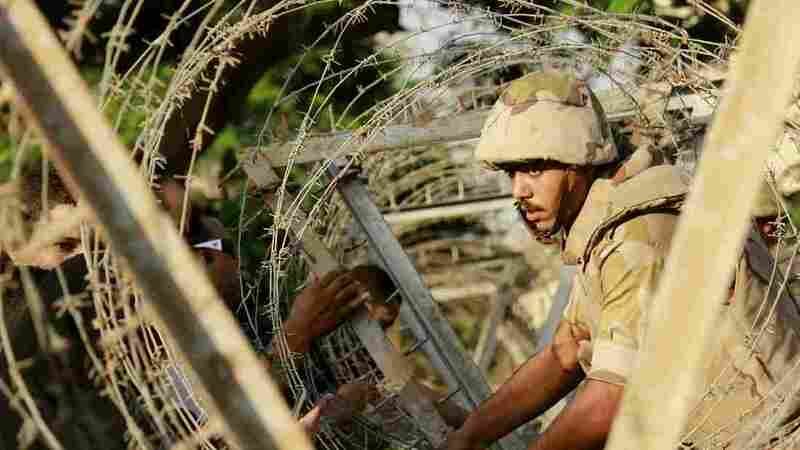 In Cairo, soldiers have put barbed wire around the constitutional court, one of many government institutions under guard. There are, as NPR's David Greene adds, "fears the country might be headed toward a civil war." William Hague, the U.K.'s foreign secretary, has told the BBC that it will take "years or maybe decades" for the turmoil in the Middle East and Arab world to "play itself out." The situation in Egypt in particular, he says, is "very bleak." Hague added that it is "hard to overstate the levels of hatred and mistrust between the various sides of politics in Egypt."